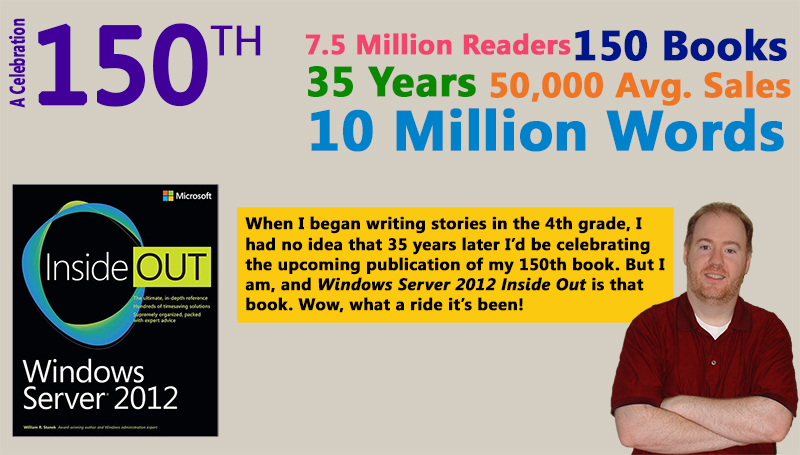 In 2013, I celebrated huge milestones in my career as a writer, including the publication of my 150th book and having reached 7.5 million readers worldwide. I've been a writer for a lot of years and it was great fun to take time out to connect with readers over the past few months. As I looked back on the many years as a professional writer, I started looking forward to the future. Although I'd been a writer for a long time before my first book was published, it was really 1994 that my writing career began. That's when I began work on a little book called Electronic Publishing Unleashed. Okay, it wasn't a little book at all; it was a 1050-page monster and I wrote 800 pages of it over a 6-month period while working full-time in the military and attending multiple classes in my graduate program at Hawaii Pacific University. I wrote the next monster book in 5 months while doing the same. Both books were huge bestsellers that set the course of my life. So on to that forward looking stuff--the part where I wondered what was next--and that's where I began to wonder about the 10 millionth reader. If the past was a guide for the future, would it take another 5 to 6 years of writing to get there? As I pondered this, a reader pointed out that if 7.5 million had purchased my books and my books had been checked out of libraries about 2 million times, that meant the 10 million reader milestone was right around the corner. Or was it? Hmmm... and so the search began.